Actually doing things hasn't always been my area of expertise. I'm great at thinking about doing things - better still at imagining doing things I almost certainly never will - but when it comes the pragmatic, the getting-stuck-in, I'm not exactly your go-to guy. So it is that my shed has been leaning against my allotment fence, unbuilt, for about six weeks now. Another personal flaw is my innate tendency to assume everything I have to do will be easy, requiring no planning, equipment or compromise of any kind. Overconfidence, naivete? A little of both. I'm working on it. Anyway, in the meantime, Henry appeared. Henry is an established figure among the local allotment group, and who constitutes the elder half of what I'm told is a crack father-son shed building team. We met as arranged yesterday morning at my plot at 10am. Henry explained everything he would have to do to get the bloody thing actually built, which I didn't really understand, but pretended I did. He'd provide all the parts and tools, and put the thing together with his still unseen son, "straight away", a time period he left enticingly vague, but with an undertone of optimism and maybe even urgency. All I have to do is get the "roofing felt", whatever that is, and it's a done deal, for £100. I'm happy about this, but there's a sprinkling of disappointment. 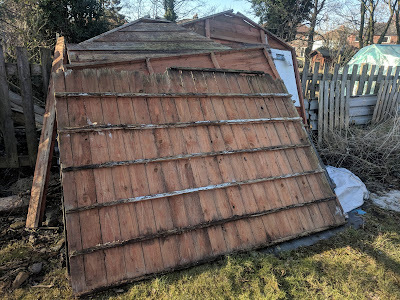 I loved the idea of buildlng the shed myself, learning by doing, probably with some online help from a community of shed enthusiasts I've been gathering over at /r/shedditors making stupid mistakes, learning from those, and ultimately succeeding. But the fact is this would probably take much longer than paying someone who already knows what they're doing to do it, and I really want a shed. So that's that. Now, to find out what roofing felt is, and how to get it delivered to an allotment. This will probably be easy and require no effort whatsoever.